I became a fan of Sylvia Massara’s writing when I read The Soul Bearers. Since then, I have read all of her books, including Playing with the Bad Boys, the first book in the Mia Ferrari series. This second book in the series did not disappoint me. 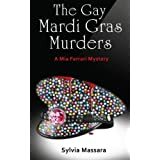 The Gay Mardi Gras Murders convincingly portrays the world of the Mardi Gras, transsexuals, drag queens and violent family vengeance. I enjoy Mia Ferrari’s smartars attitude and her unflagging determination and ability to solve the problems she encounters. She exhibits skills that help her deal with people on a sensitive, personal level, earning their confidence and getting them to open up to her. She also has an irrational dislike for Phil Smythe from the police department, and wilfully defies him,working behind his back to gleefully prove that she can achieve what his department can not. In the end she tacks down the murderer, but finds she is not invincible and cannot do everything on her own. Friends can be enemies, and enemies may turn out to be friends. I liked Mia’s personal growth in this book; while she is still bitter about her ex, she is comes to realize how important friends are, and understand that she does not need a romantic relationship to be complete. I am waiting for the next book in the series. This book shines a glimmer of light on new possibilities. I’m sure Mia will never lose her fire and determination, but will we see changes in her? Don’t miss a great read. To purchase The Gay Mardi Gras Murders go to Amazon. Once you’ve enjoyed this great read, it would be appreciated by the author if you went to Amazon and left a review!